Womens Work Suits With a Dress. Not only can we offer a trouser suit, or a skirt suit for ladies, we can now offer a great selection of shift dresses that have matching jackets, making another fantastic addition to your suit collection. On each dress page you will find a link to the full collection, showing the matching jackets, as well as the skirts and trousers that all match to make up a collection. The Carlton Shift Dress is a lovely dress for every day occasions, matched with the rest of the Business Boutique Collection to make the perfect outfit. 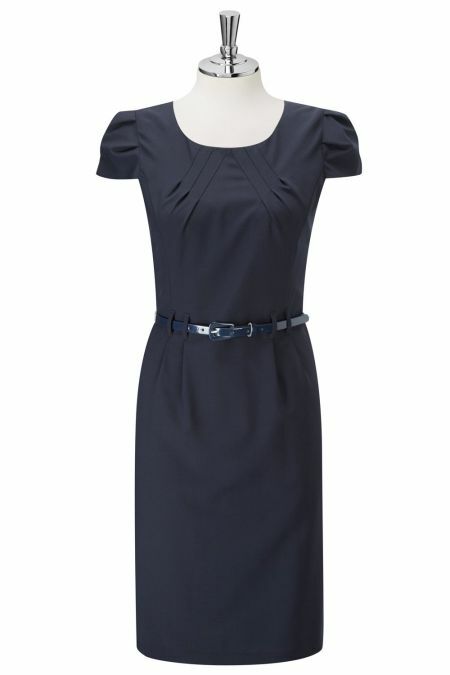 Brook Taverner Corinthia V neck Dress 2246 Navy, Black, Charcoal and Mid Grey.